Plain and Simple’s roving reporter/man about town and clubbing addict Jammy brings you his eye view of the event he was partying at in the last week… This time he spent his jaunt at ELM (East London Movement) and at Closer with Chris Liebing. Hello and welcome to Jammy’s Jaunts! Your weekly clubbing review of London! Let me start off by thanking everyone who read my Berlin Jaunt last week. It really was pretty special and I had a great time writing about it. I hope you had fun reading it and actually made you feel like you were actually there. Definitely an amazing experience and for sure and I want to conquer Berlin again in the summer! So back to reality of London life and the parties that I went to, over the past weekend. The weekend jaunt started off on Friday with the next instalment of the ELM (East London Movement) parties. Headlining for them this time around was Dinky (Visionquest, Cocoon, Crosstown Rebels) the Chilean-born Berlin based DJ and producer recently made her Visionquest debut with a great three track EP of mesmerising beauty and elegance. 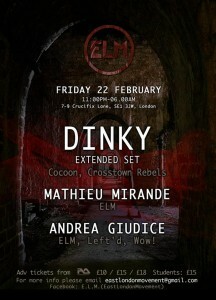 Also accompanying her on the decks were ELM residents Mathieu Mirande and Andrea Giudice warming things up. Just as always, their parties have found their home at Crucifix Lane and arriving around half midnight, the place was beginning to fill. As with all ELM parties, they always start late and people begin to turn up around 1am. So to start things off Mathieu Mirande played his trademark warmup literally to warm everybody up as it was pretty freezing inside the club, he even had his coat done up, it was that cold! The usual ELM decor was up and it was great to see loads of friendly and familiar faces at the party. A real nice feel and good vibe about the party. By the time Dinky came on the club was comfortably filled and it was really nice to see her play again. The last time I caught her was the Spilt Milk daytime party last summer which was pretty incredible as this was the special Jubilee weekend. This time around she played a vocal set by singing on her tracks and recording and looping her voice and adding it into tracks which was very cool to see. I’ve never seen anyone do that before and it sure was an innovative way to add a new dimension to the mix or the way that you are playing. She played for 3 hours and the groove was really there to see. The crowd loved it and the sound was really clear on the soundystem in Crucifix Lane. After her, was a brief B2B display by the ELM duo of Mirande and Giudice. They played for a good 30mins until Giudice came on fully and played till the end. It was good to see him play at the end as I have never fully caught him play before and it made for a nice finish. Watch out for their next party, next Friday 15th (day before my birthday!) with headliners D’Julz and Audiojack. Definitely worth if you are in London and fancy partying on a Friday. Great little Friday jaunt here! 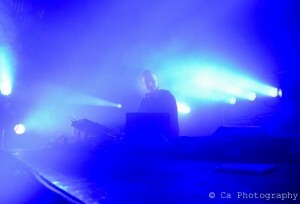 Saturday was the very special LWE presents Closer. 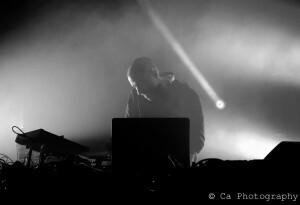 This time around CLR head Chris Liebing played a very excellent and intimate 6 hour set. Local heroes Rejam performed a 2 hour warmup and set the crowd well for the maestro to begin. It was refreshing to hear such good techno this weekend, considering I had just come back from Berlin and this was probably the closest thing I would get to it, in London this weekend! I know I can’t really compare but this was what I was really waiting for! A really nice warm build up from around Midnight till about 1am and from 1am onwards, Liebing really showed why he is one of the most revered Techno DJ’s in the world. Six hours is nothing to him and he is widely known to play 10 + hours. This would seem like a nice buildup and at the end of the night he said he could have carried on for much longer. I was lucky enough to chat to him after and the obligatory photo with him which was pretty cool. 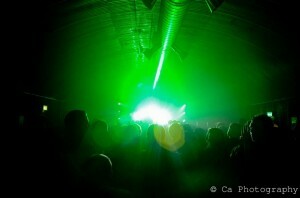 The crowd loved every smashing drop, bassline and thunderous reverbs which was exactly what they came for. The Sidings was packed. Really packed and it was pretty hot in there. Only one arch was used for the event and everyone crammed in there. The music was so good, time flew by and I’m pretty sure it got harder as the night went on which was perfect for the crowd and for everyone who wanted to see Chris Liebing do what he does best. The sound of CLR and Liebing I know isn’t to many people’s taste especially if you’re not into Techno but this was just a snapshot of what things are like and if you went to the 2 very special CLR parties last year in London, you will know what I mean. It’s a very acquired taste and they are very good at providing the best in Techno, so as you can imagine I was very much in my element. It’s no Berghain, but this is London and we have to deal with what we have! As the night progressed the music was of the highest quality and the soundsystem was really clear and crisp. Very impressed with the way the Funktion 1 soundsystem was performing the massive stress Liebing was giving it! The 6 hours really did fly by and the crowd were enthralled and the place was rammed beginning till the very end. It was a really good night and I’m sure LWE will present more of their Closer nights in 2013, so keep a good look out for that! What a weekend of Jaunt activity!! Same time, next weekend? !